Interested and eligible candidates may forward their application form along-with all necessary documents to The Correspondent of EIT Polytechnic College, Erode on or before 3rd September, 2016. 1. Proof for 8th Std qualification. ie 8th Std Mark-sheet, which is signed by School Head Master. Photo copy of this certificate must be attested by Gazetted Officer / Class 'A' Officer / Class 'B' Officer. Current place of posting is DGQA CQA Avadi Chennai. But post is all India transferable. 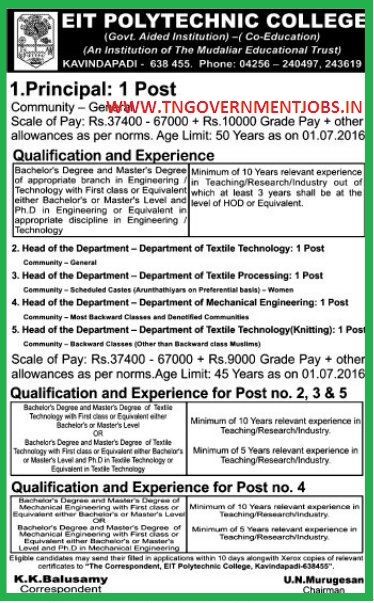 Kindly mention as "APPLICATION FOR THE POST OF............ " in envelope cover left top side. Enclose one self addressed envelope (30*12 cm size) with Rs.25 stamped. Kindly prepare the Application form along with the following details and send application with necessary enclosures, which are attested by the gazetted officer and those application must be send by ORDINARY POST only. 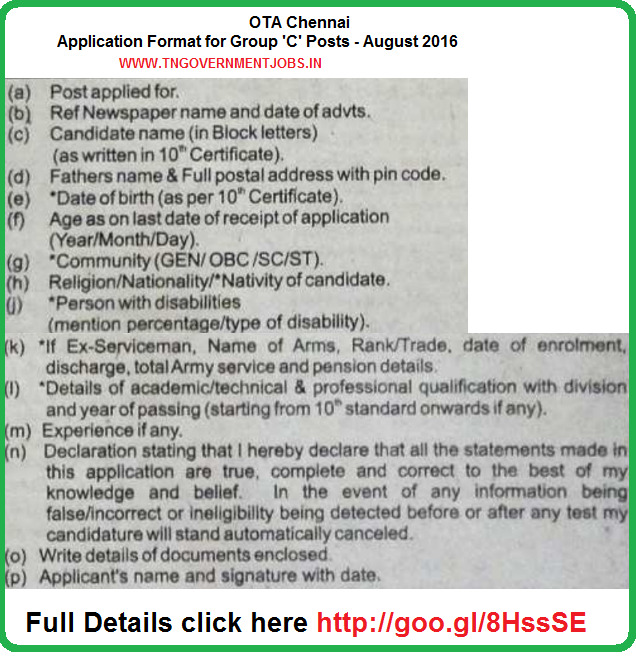 UR candidates should pay the application fee Rs.50 by indian postal order in the name of 'THE COMMANDANT, OTA, CHENNAI. SSLC or equivalent is the basic qualification for all the posts. Application cover must be superscribed as "Post applied for ...........". One person should send only one application form. If you are interested to apply more than one post, you should mention the post details in appropriate place of one application itself and application envelope cover. Place of Posting Aavin Trichy, Perambalur, Karur and Ariyalur only. Interested and eligible candidates may apply with prescribed application format along-with all necessary documents duly self attested to the following address on or before 21st July, 2016 through Registered Post / Speed Post. Candidates must be residing in Chennai. Application Fee (Demand Draft) Rs.250 for Manager (Engineering) only. All other posts there is no application fee. Interested and eligible candidates may apply with prescribed application format along-with all necessary documents duly self attested to the following address on or before 20th September, 2016 through Registered Post / Speed Post. Application Fee Rs.600 for UR / OBC candidates. 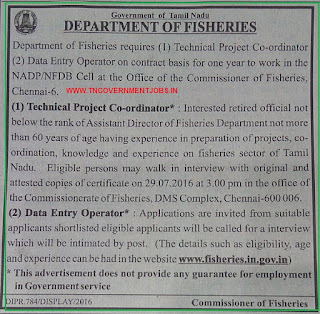 BE / BTech candidates are NOT ELIGIBLE for this recruitment. Please do not apply. Cut off date for age limit 01.08.2016. Application Fee Rs,100 for SC / SCA / ST candidates. Data Entry Operator - Consolidated Pay 15000 pm - Diploma in Computer Science with experience in data entry operation - Minimum age 25 years; maximum age 35 years - Contract basis for 11 months. The above vacancies are purely on contract basis. Date of interview will be intimated separately to the selected candidates for data entry operator post. 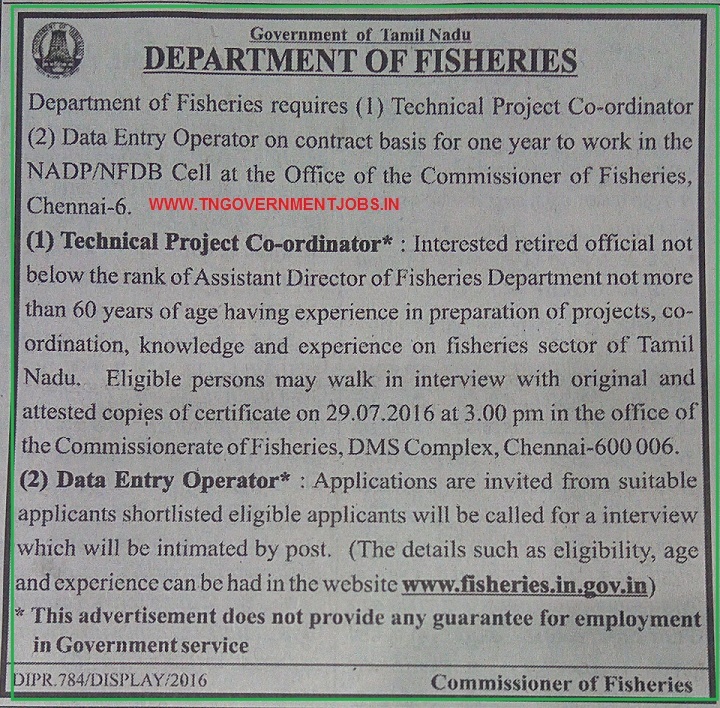 Interested and eligible candidates may attend the walk in interview for Technical Project Coordinator Post on 29th July, 2016 at 3.00 pm. SBI Bank fee paid challan copy. Sign across on the photo, which is pasted in application form. All certificates, must be enclosed with self attested. No Fee for SC / SCA / ST / PwD / Women / CSIR candidates. Application envelope superscribed as "Post applied for Junior Stenographer"
Selections through written test (General English and General Knowledge) and interview.